How I became a science diplomat. After I got my Ph.D., I realized that I wanted to make a difference outside of the lab. Then I learned about science diplomacy. 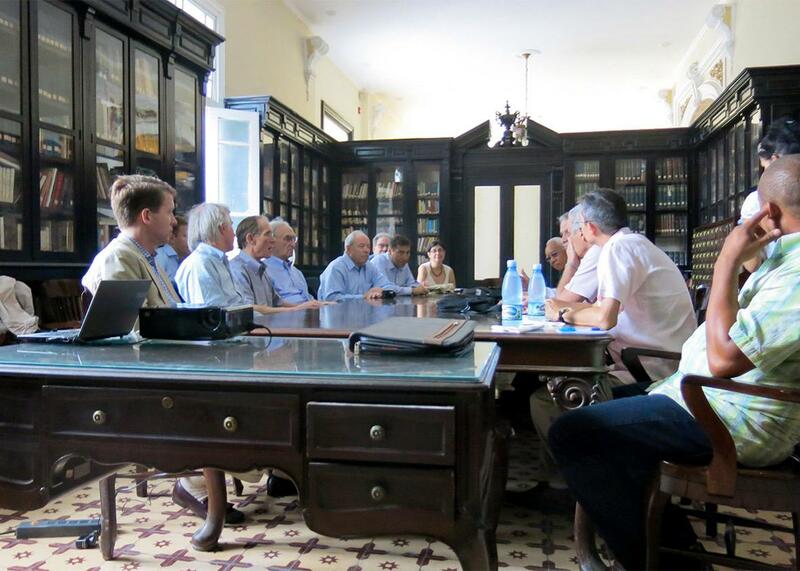 A AAAS-led group meets with its hosts at the Cuban Academy of Sciences in Havana. When I finally finished my Ph.D. program after 11 years of training for a research career in the biomedical sciences, I couldn’t help feeling that something was missing. I grew up convinced that science was the best tool we had to improve the world. But my research, though immensely intellectually gratifying, wasn’t making much of a positive contribution to society. Spending all of my time inside a dark microscopy facility firing multicolor lasers at petri dishes didn’t seem to bring about much change (except to the tiny cells in the dish). What was the point of all this, I wondered, if no one outside of the building understood or appreciated the value of what I was doing? Until that moment, I had seen science and diplomacy as opposites: While science pursues the interests of all humankind, diplomacy seeks to advance national interests. The realization—that science and diplomacy are not opposites but can be natural allies—changed the course of my career. Scientists have long collaborated across borders. The scientific values of transparency, rationality, and universality are the same all over the world. Scientists are typically altruistic, open-minded, and passionate people who believe science serves humanity. They are natural consensus builders, driven by evidence, and generally respected in most countries and societies. Since these characteristics are very valuable in the conduct of international relations, science diplomacy appeared as the perfect tool to make all my long-held idealistic views of science actionable and operational. Science has been used as a tool for diplomacy and peace-building for several decades by the United States and many countries around the world. For example, in 1961 John F. Kennedy established a science and technology cooperation agreement with Japan in an effort to restore the intellectual dialogue between the two countries after World War II. In 1979, President Carter and Vice Premier Deng Xiaoping signed a science and technology agreement between the United States and China following the establishment of formal diplomatic relations. The European Organisation for Nuclear Research, commonly known as CERN, was established by a handful of European scientists who saw an opportunity to bring together former World War II antagonists and contribute to post-conflict integration through science. But perhaps the field in which the impact of science diplomacy is most familiar and recognizable is space exploration. The famous “handshake in space” in the Apollo-Soyuz 1975 mission between a U.S. astronaut and a Soviet cosmonaut symbolized a thawing of tensions in the long-running Cold War. Despite political tensions between the United States and Russia, cooperation continues today in orbit aboard the International Space Station. And I don’t want to give away the ending, but The Martian offers a fantastic example of science diplomacy, in the cooperation between NASA and the Chinese space program. International science engagement challenges the negative views peoples in countries in conflict have about each other and provides a common language all peoples can agree upon that transcends political and ideological divides. A modern-day example of science diplomacy is SESAME, a major intergovernmental scientific facility in Jordan whose members are nine Middle Eastern countries, with the twofold goal of building scientific capacity in the region and fostering mutual understanding across political, cultural, and religious boundaries. All of these examples may seem too high-level for most people to be involved with, but there are multiple ways to experience and contribute to science diplomacy. After my trip to the World Science Forum, I moved to Washington, D.C., for a research fellowship at the American Association for the Advancement of Science Center for Science Diplomacy, and I was fascinated to discover a vibrant ecosystem of government agencies, universities, think tanks, and nongovernmental organizations working to bring the scientific and foreign policy communities closer together. Currently, my day-to-day activities involve engaging with Cuban colleagues to implement the historic agreement signed between AAAS and the Cuban Academy of Sciences in 2014 to advance scientific cooperation between Cuban and U.S. scientists in key areas of mutual interest to both countries, such as tropical infectious diseases, brain disorders, cancer, and antimicrobial drug resistance. My training in biomedical sciences, the cross-cultural awareness provided by my international experiences, and my bilingual proficiency in English and Spanish happened to be the right combination for this project. Unknowingly, I had acquired the right set of skills and experiences of a “science diplomat.” My work builds on a long history of collaboration between U.S. and Cuban scientific institutions tracing back to the mid–19th century that has continued despite the lack of diplomatic relations between the two countries. When I left academia, I could have never imagined that someday I would be able to use my scientific skills to help improve relationships between two countries that have been enemies for nearly six decades. Science diplomacy is not new, but is more important than ever. In our 21st-century globalized world, many of the challenges we face, from global health to climate change, from water, food, cyber, and energy security to nonproliferation, have scientific and technological dimensions and cross-national borders, and no country will be able to solve these problems on its own. We must prepare the next generation to tackle these challenges, and although there are limited formal opportunities for “career” science diplomats—working as a science adviser to the foreign ministry or as science attaché at an embassy are some examples—there is a unique opportunity for universities, NGOs, the private sector, multilateral organizations, and civil society at large to harness the potential of science to bridge citizens, institutions, and countries all around the world. The AAAS Science & Technology Policy Fellowships place dozens of scientists and engineers each year in the federal government to infuse scientific and technical expertise into foreign policy, and Arizona State University’s Science Diplomacy & Leadership effort, which I designed, provides a policy and diplomacy immersion experience for early-career scientists and engineers from all countries in the Americas in Washington, D,C. (Disclosure: ASU is a partner with Slate and New America in Future Tense.) Similar programs include the AAAS and World Academy of Sciences summer course in science diplomacy held in Trieste, Italy, the Hurford Science Diplomacy Initiative at Rockefeller University, and the science diplomacy course at New York University. More people are now learning about the intersection of science and diplomacy through media avenues, from social media to wide-release movies. The recent Twitter campaign #IAmAScienceDiplomat saw hundreds of scientists from around the world showcasing their international research projects to prove that science has no borders.